Quick is high on my list of redeemable recipe qualities. Although, it’s right up there with tasty and healthy. This sometimes makes for a challenging recipe hunt. I picked up a few packs of MTR vermicelli noodles a few weeks back for experimenting with vermicelli style upma, or semiya upma. As I started making the noodles though, I decided the taste would really benefit from a splash of soy sauce and chili garlic hot sauce. The result was spicy, soy spiked noodles mixed with fresh (I use this word loosely since I did use frozen peas) veggies and topped off with crunchy cashews. I’m going to classify this as “Indian Chinese” since anything that mixes mustard seeds with soy sauce seems a little bit Indian, a little bit Chinese to me. This recipe is great because it’s a real “clean out you vegetable crisper” recipe – you can add cabbage, bell peppers, or broccoli to this – really whatever you find in the fridge. Let me know if you think of any other good add ons. In a deep skillet or saucepan, heat about half a tablespoon of cooking oil on medium heat. Add the vermicelli noodles and stir frequently until they are a little golden (about 2-3 minutes). Set them aside on a plate. This will help prevent the noodles from getting mushy and sticky when you mix them with the vegetables. Using the same pan, add a little more oil if needed then add mustard seeds and allow them to pop. Add the channa dhal, garlic, chili peppers, curry leaves and cashews. Cook for about 3-4 minutes until the channa dhal, garlic and cashews look golden. Add the peas and carrots and cook covered for another 2-3 minutes until the carrots are tender. Add about 3-4 cups of water and bring to a boil. 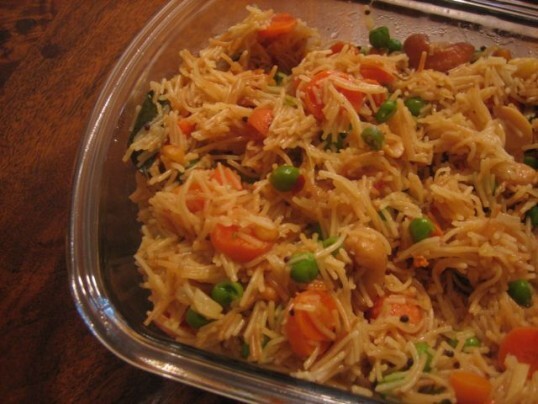 Mix in the vermicelli noodles and allow to cook until the water has been fully absorbed. Mix in soy sauce and chili garlic sauce. Garnish with cilantro (optional) and serve hot. For those of you who are curious, upma is a South Indian dish that’s commonly served for breakfast. There are many different varieties and methods, but one common variety is made using suji or semolina, durum wheat. We have it more often as a light dinner or lunch. You can find some tasty recipes for the different varieties here and here and one of my all time favorites made using cous cous here. I’m sending this recipe over to Mahimaa’s 15 Minute Cooking at Spices Etc. fusion cooking at its best. This sounds like a really delicious lunch option! I just love adding cashews to entrees. Lovely and beautifully cooked fusion noodles makes me hungry! That looks delicious. Great idea to chinisize(???) an Indian dish. Regarding your question about Seitan on my blog: I use home made seitan (steamed). You can find the recipe on Julie Hasson’s Everydaydish.tv. ND: Lol over chinisizing. Thanks for the seitan tip…I’m definitely going to try making it at home. I’m finding the store bought stuff to be awful. Going to have to keep this in mind because I know in another week I am going to need a clean out the fridge quick meal. Oh how I love those so much and I am always shocked how wonderful they taste. Looks awesome and happy to hear the experiments are going well! ND: Yeah, kitchen experiments and fridge cleaning are sometimes the best. Although I hate when I do that but forget to write down what I did! I made these great peanut butter sauce based noodles once…no clue what went in them. wow.. new recipe. very creative. ND: hi, wow – thanks for stopping by hungry desi and for the lovely compliments. and will be tweetinjg this to my followers! Fantastic blog and wonderful design and style.